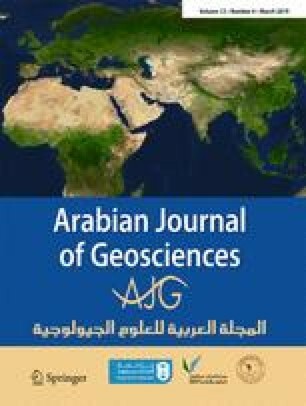 This study aims to determine the activity concentrations of natural radionuclides (226Ra, 232Th, and 40K) in the agricultural soil of southeastern Nile Delta, Egypt, in order to assess their influence on the occupational radiation health hazard indices. It was found that the mean activity concentrations of 226Ra, 232Th, and 40K were 35.53, 23.59, and 266.41 Bq kg−1, respectively. The effect of the industrial activities in the study area on the activity concentrations of radionuclides is slight for 226Ra while negligible for 232Th and 40K. Soil characteristics especially the fine particles play the major role in the distribution of 40K, while the distribution of 232Th is less influenced by the soil characteristics. On the other hand, the distribution of 226Ra shows no obvious association with these characteristics. The calculated radium equivalent activity index (Raeq) and external hazard index (Hex) fall within the save rang. However, those of absorbed dose rate (Dex) and annual effective dose (AEDex) exceed the world average values in about 16.7% and 61.1%, respectively. The calculated values of the excess lifetime cancer risk (ELCR) are higher than those of the world average. This implies the high probability of developing cancer over the lifetime of the farm workers. In this study, we recommend performing periodical inspection for the industrial activities and their wastes in the study area and monitoring the level of activity concentrations of different radionuclides in the studied soil as well as the cultivated crops. The authors would like to express their gratitude to the numerous farmers for permitting the collection of the samples used in the present study and for providing helpful information. Thanks go also to Dr. A R Abu Zeid (Assiut University, New Valley Branch) for providing Landsat data and helping in the application of the GIS technique. Sincere thanks to Prof. M M Abu-Zeid (Ain Shams University) for revising this manuscript and providing valuable comments. The suggestions and constructive comments by anonymous reviewers are gratefully acknowledged.